Over the weekend thousands of Twitter users boycotted the service in protest at the announcement that the service will begin withholding tweets based on the demands of local governments and law enforcement. Protesting against censorship is laudable, but it is worth pointing out that most online services already do the same, whether it’s Google’s Orkut; Apple removing apps from its store; or Facebook disabling protest groups. The official twitter help center article includes the way to bypass it – simply – all you have to do is change your location to another country and overwrite the IP detection. Quantity – can you imagine a govt trying to censor on a tweet by tweet basis a trending topic like Occupy or Egypt or Revolution – the amount of tweets can bring up the fail whale despite the genius twitter architecture , so imagine what is gonna happen to a paper work based system. Speed – twitter, probably one of the fastest updating systems online – and legislative bodies move at glaringly different speeds – It is impossible for a govt to be able to issue enough approval for a trending topic or anything with enough tweets/interest on. “When YouTube is taken off your nation’s internet, everyone notices, not just dissidents. So if a state shuts down a site dedicated to exposing official brutality, only the people who care about that sort of thing already are likely to notice. What Twitter have announced (and since clarified) perhaps makes this all-or-nothing censorship less likely, but it also adds to the ‘Don’t look at that!’ effect. The very act of censorship, online, can create a signal that is counter-productive. As journalists we should be more attuned to spotting those signals. This entry was posted in online journalism, regulation, twitter and tagged boycott, censorship, ethan zuckerman, evgeny morozov, mireille raad, net delusion, twitter, twitterblackout on January 30, 2012 by Paul Bradshaw. Terence Eden filmed the above video demonstrating O2’s phone security flaw. He put it on YouTube with the standard copyright licence. And someone at Sky News ignored that when they used it without permission. But what’s interesting about Terence’s blog post about the experience is the legal position that Sky then negotiated from – an experience that journalism students, journalists and hyperlocal bloggers can learn from. “After consulting with our Sky lawyers our position is that we believe a £300 settlement is a fair and appropriate sum. This sounds largely believable – particularly as Sky were “very quick” to take the infringing content down. That would be a factor in any subsequent legal case. Notably, the Daily Mail example he quotes – where the newspaper reportedly paid £2000 for 2 images – included an email exchange where the photographer explicitly refuses the website permission to reproduce his photographs, and a period of time when the images remained online after he had complained. These are all factors to consider whichever side of the situation you end up in. This entry was posted in regulation, television, user generated content and tagged copyright, O2, Sky, Terence Eden on January 27, 2012 by Paul Bradshaw. The £10,000 question: who benefits most from a tax threshold change? “The crucial difference is in methodology – while the TPA used individuals as its basis, the IFS used households as provided by the Government data. So: same change, very different stories. 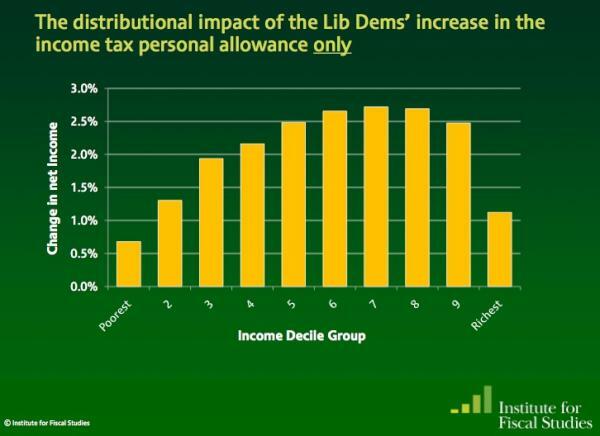 In one story (Institute for Fiscal Studies) it is the the wealthiest that appear to benefit the most; but in the other (Taxpayers’ Alliance via Guido Fawkes) it’s the poorest who are benefiting. Did you spot the difference? 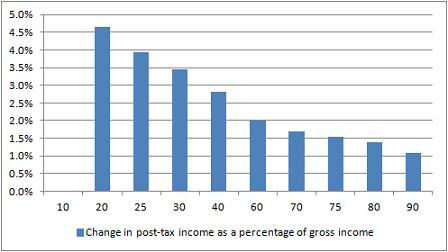 The different y axis is a slight clue – the first chart covers a wider range of change – but it’s the legend that gives the biggest hint: one is measuring change as a percentage of gross income (before, well, taxes); the other as a change in net income (after tax). James’s colleague Mary Hamilton put it like this: “4.5% of very little is of course much less than 1% of loads.” Or, more specifically: 4.6% of £10,853 (the second decile mentioned in Fawkes’ post) is £499.24; 1.1% of £47,000 (the 9th decile according to the same ONS figures) is £517. (Without raw data, it’s hard to judge what figures are being used – if you include earnings over that £47k marker then it changes things, for example, and there’s no link to the net earnings). In a nutshell, like James, I’m not entirely sure why they differ so strikingly. So, further statistical analysis welcome. UPDATE: Seems a bit of a Twitter fight erupted between Guido Fawkes and James Ball over the source of the IFS data. James links to this pre-election document containing the chart and this one on ‘Budget 2011’. Guido says the chart’s “projections were based on policy forecasts that didn’t pan out”. I’ve not had the chance to properly scrutinise the claims of either James or Guido. I’ve also yet to see a direct link to the Taxpayers’ Alliance data, so that is equally in need of unpicking. In this post, however, my point isn’t to do with the specific issue (or who is ‘right’) but rather how it can be presented in different ways, and the importance of having access to the raw data to ‘unspin’ it. This entry was posted in data journalism and tagged Full Fact, guido fawkes, IFS, James Ball, statistics, tax threshold on January 27, 2012 by Paul Bradshaw. Word cloud or bar chart? One of the easiest ways to get someone started on data visualisation is to introduce them to word clouds (it also demonstrates neatly how not all data is numerical). Using tools like Wordle and Tagxedo, you can paste in a major speech and see it visualised within a minute or so. But is a word cloud the best way of visualising speeches? The New York Times appear to think otherwise. 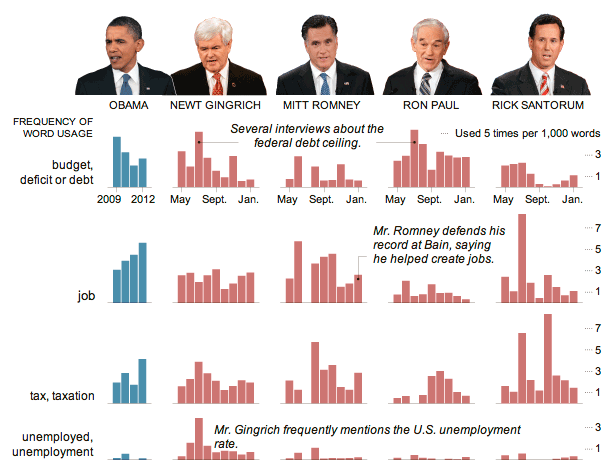 Their visualisation (above) comparing President Obama’s State of the Union address and speeches by Republican presidential candidates chooses to use something far less fashionable: the bar chart. Why did they choose a bar chart? The key is the purpose of the chart: comparison. If your objective is to capture the spirit of a speech, or its key themes, then a word cloud can still work well, if you clean the data (see this interactive example that appeared on the New York Times in 2009). But if you want to compare it to speeches of others – and particularly if you want to compare on specific issues such as employment or tax – then bar charts are a better choice. Compare, for example, ReadWriteWeb’s comparison of inaugural speeches, and how effective that is compared to the bar charts. In short, don’t always reach for the obvious chart type – and be clear what you’re trying to communicate. This entry was posted in data journalism, newspapers and tagged bar charts, New York Times, tagxedo, visualisation, word clouds, wordle on January 27, 2012 by Paul Bradshaw. Last year I was commissioned to write a report on ‘Social Media and News’ for the Open Society Media Program, as part of the ‘Mapping Digital Media’ series. The report is now available here (PDF). attempts by governments and corporations to control what happens online. These and other developments (such as the growth of APIs which “connect the information that we consume with the information we increasingly embody”) are then explored with specific reference to issues of editorial independence, public interest and public service, pluralism and diversity, accountability, and freedom of expression. That’s quite a lot to cover in 4,000 words. So for those who want to explore some of the issues or cases in more detail – or follow recent updates (and a lot has happened even since finishing the report) – I’ve been collecting related links at this Delicious ‘stack’, and on an ongoing basis at this tag. This entry was posted in blogging and tagged accountability, apis, copyright, Freedom of speech, Hyperlocal, independence, Mapping Digital Media, Open Society Media Program, pluralism, privacy, public service on January 24, 2012 by Paul Bradshaw.